Enjoy a multi-dimensional day-long extravaganza of food, music, entertainers, fireworks and more... all with FREE admission! Starting with the Moscow parade and ending with Stowe's incredible annual fireworks display, this is a great day to spend in Stowe. & Miles of Sales. 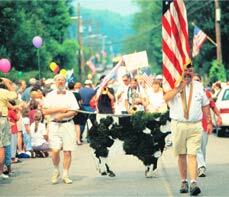 Also starting July 4 is the famous Stowe 7 Miles of Sales! This great town-wide event is one not to be missed! Enjoy BIG savings throughout the town, visit: 7 Miles of Sales for more information. The Village Festival from 11 am-3 pm, includes, face painting, dunking booth, music, bouncy house, clowns, balloons and food. There is also 7 miles of sales to keep shoppers busy! The Moscow parade is famous for it's casual and small town charm. All floats are put together the morning of the parade and participants are required to spend no more than $10 on their decorations. This results in some very creative efforts! All are welcome to this fun and funky parade. The parade starts at 10AM so be sure to arrive early! How to get there: Traveling north to Stowe on Route 100, look for Moscow Road on your left (just past The Fly Rod Shop). Follow Moscow Road to the village of Moscow. This is a traditional, old-fashioned Independence Day parade with floats, animals, clowns, civic groups, businesses, non-profits, kids, music, and a whole lot more! The parade will begin at 1PM at the Stowe Events Field (off Weeks Hill Road). The parade will travel down the Mountain Road towards the village, onto Main Street and ends at the Memorial Park. Celebrate with street performers and musicians! Face painting, caricature artists, and bouncy house for the kids. Dunking booth featuring local dignitaries, festive food and loads of fun! Visit stowevibrancy.com for more information. Fabulous July 4th sales in the Village and along the Mountain Road. The Stowe "World's Shortest Marathon"
Join the 1.7 mile Fun Run. Starting at the intersection of Routes 100 & 108. Open to all comers! Starting at 6pm, games and food for the family, with spectacular fireworks at dusk. Admission and most activities are FREE! Enjoy live music with 66 City Band, face painting, balloons, BBQ, kids carnival games, ice cream, Bouncy House, Pedestal Joust, hay rides, Touch-a-Truck, old fashioned games, popcorn, cotton candy and more! Bring your blanket and lawn chairs for the Best View in Town. FREE ADMISSION! For details, please visit stowevibrancy.com.